Visual Basic is a third-generation event-driven programming language first released by Microsoft in 1991. It is a user-friendly programming language designed for beginners and It enables anyone to develop GUI window applications easily. Many developers still favour VB6 over its successor VB.NET. In Visual Basic 6, you can create any program depending on your objective. You can create educational programs, financial programs, games, multimedia programs, animations, database applications and more. To develop and test your applications, we recommend that you Move your programming/testing environment into the cloud with reliable citrix xendesktop from CloudDesktopOnline at cheapest xendesktop pricing powered by Apps4Rent.com with 24*7*365 days top-notch tech-support. We have created many sample codes, please browse them on the sidebar. You are welcome to use the sample code as a reference for your assignments and projects. However, the usage of the sample codes for commercial purposes without prior consent from the webmaster is strictly prohibited. 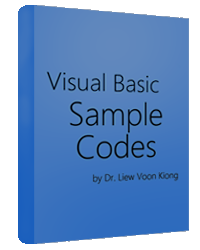 Visual Basic Sample Codes E-Book is written by our webmaster, Dr.Liew. 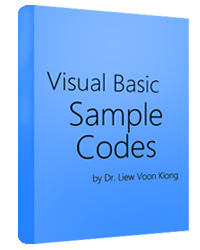 It comprises 258 pages of captivating contents and 48 fascinating Sample Codes.Perfect source of reference for your VB projects. Check it out. The Tutor and webmaster of Vbtutor.net, Dr.Liew Voon Kiong , holds a Bachelor Degree in Mathematics, a Master Degree in Management and a Doctoral Degree in Business Administration. He obtained the DBA degree from the University of South Australia. He has been involved in programming for more than years. He created the popular online Visual Basic Tutorial in 1996 and since then the web site has attracted millions of visitors .It is the top-ranked Visual Basic tutorial website in many search engines including Google. Besides that, he has also written a few Visual Basic related books. One of the books, Visual Basic 6 Made Easy was published by Creativespace.com, an Amazon.com publisher.